My reason to live arrived a few days ago. No, I didn’t find a boyfriend; my Licorice of the Month Club selections arrived! By now, you all know how much I love my monthly licorice delivery. This month we got Sweet Finnish Licorice, Kokindjes from Holland, and Kookaburra Allsorts from Australia as a bonus. I tried the Kokindjes first, not sure if I would like them. I was worried they would be some hideous, unsweetened thing, but in fact they were very good. They are the size of small gumdrops, and are very soft. Their flavor is interesting, as it is both salty and sweet at the same time. They are certainly a departure from typical American licorice flavor, but they were still really good. Next up was the Sweet Finnish Licorice. These were short lengths of solid tubular licorice. They were a bit harder than I prefer; with a rather weak jaw, they were kind of hard to chew. Still, they were a nice flavor, with mild sweetness but plenty of licorice kick. The bonus was a small bag of Australian Kookaburra Allsorts. I was very pleasantly surprised with these. 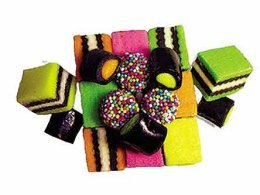 Normally, I find that Allsorts have a bit too much coconut for me, but these were really really good. Each color has a distinctive flavor, ranging from banana to lime. Whatever licorice was included was so mild as to be unnoticeable. Overall, a really nice treat. Panda Liquorice comfits are the best comfits I’ve tasted. If you’ve never tasted one, they are a hard candy shell around a liquorice core.